A group of kids in Washington, D.C., thought they were taking an ordinary school-bus ride to the USA Science and Engineering Festival recently. But much to their surprise, they suddenly took a detour—to Mars. 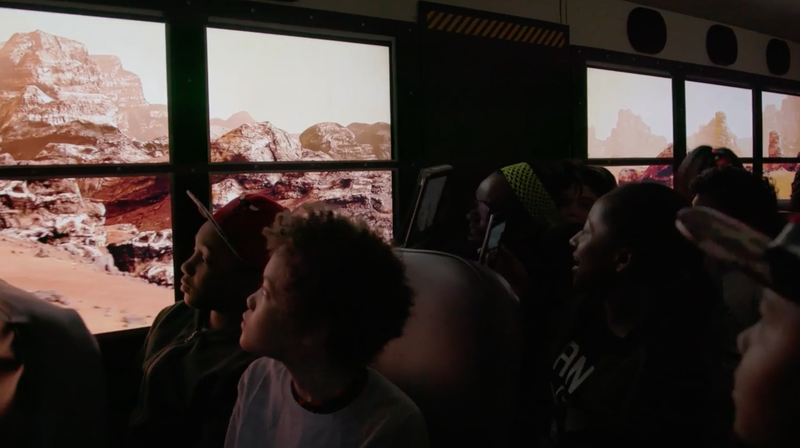 This was thanks to Lockheed Martin, which created, with help from McCann and Framestore, the Lockheed Martin Mars Experience Bus, in which the windows of a bus were turned into screens and a "group VR" experience made the pint-size riders feel like they were traveling around the surface of the Red Planet. The video below shows the stunt in action, and it's clear the kids were thrilled to have made a journey to a neighboring planet in seconds that normally takes the fastest spacecraft several months. Framestore, which virtually traveled to Mars when it did special effects for The Martian (it also won an Oscar for Gravity), replicated 200 square miles of the Martian surface for the bus trip. The students came from Girls Inc. and 4H. The bus trip is part of a larger campaign from the aerospace company called "Generation Beyond," a national Science, Technology, Engineering and Math educational program that aims to bring the science of space to homes and classrooms across America and get more kids to pursue STEM careers. "Our children—the elementary, middle and high school students of today—make up a generation that will change our universe forever. This is the generation that will walk on Mars, explore deep space and unlock mysteries that we can't yet imagine," said Marillyn Hewson, Lockheed Martin chairman, president and CEO. "They won't get there alone. It is our job to prepare, inspire and equip them to build the future—and that's exactly what Generation Beyond is designed to do."